Lee Bramwell wins the Fur & Feather which is the last match of the 2018 fixtures. Well done to Eddy winning the 5th and final Winter League match of 2018. Congratulations go to Tim winning the Winter League for 2018 with Eddy in second place and Lee Bramwell in 3rd place. Congratulations to Tim winning the 4th Winter League match at Lane Head. With one match remaining, Tim leads the league on 13 points with Eddy in second place with 9 points. Well done to Tim winning the 3rd Winter League match at Bradshaws. 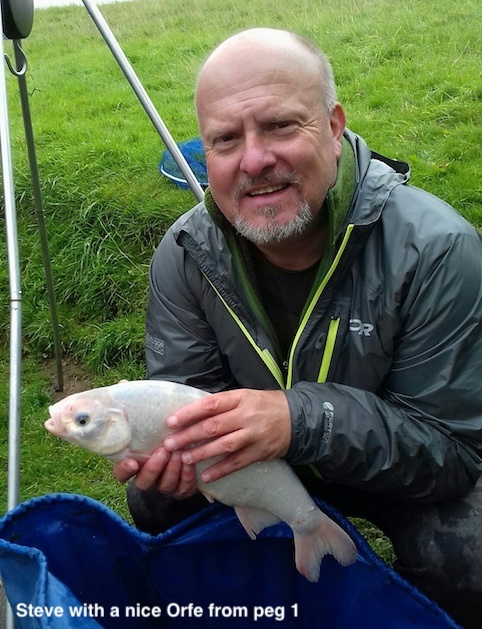 Tim caught carp & F1s consistently down the edge. 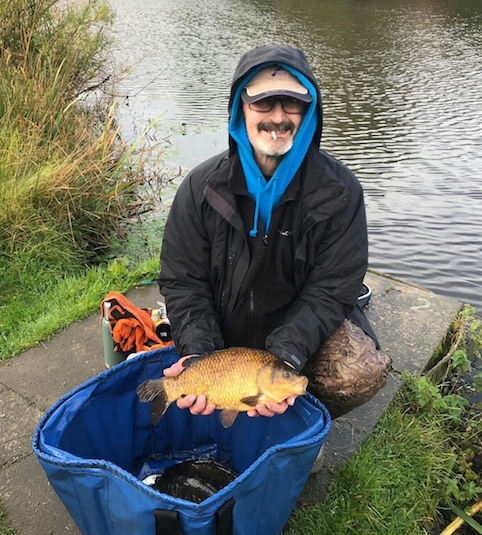 Congratulations to John winning the second of the Winter League Series. 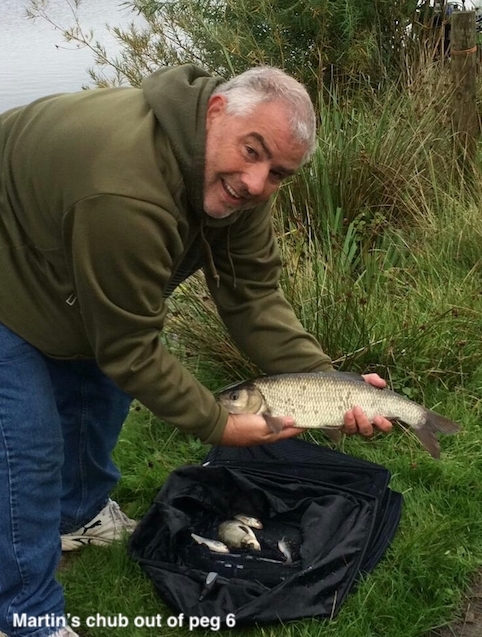 John fished feeder across on peg 2 to catch carp and also pole. 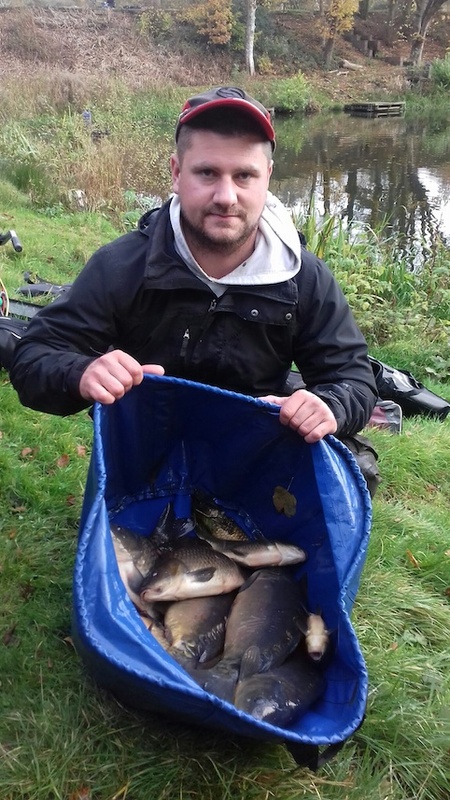 Well done to Lee in winning the first of the Winter League matches. The final match of the season was for the new 'Shoot The Moon' trophy, which was kindly sponsored by Oliver Zebedee-Howard. And fittingly, the first name on the new Trophy will actually be Olly himself! 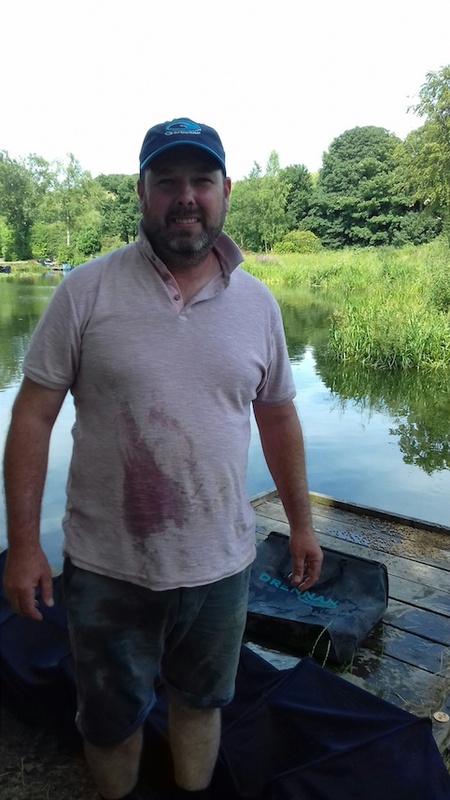 Basically he had it won in the first 45 minutes with four cracking carp in peg 5. Also, the last match of the season was going to determine the Club Champion for 2018. 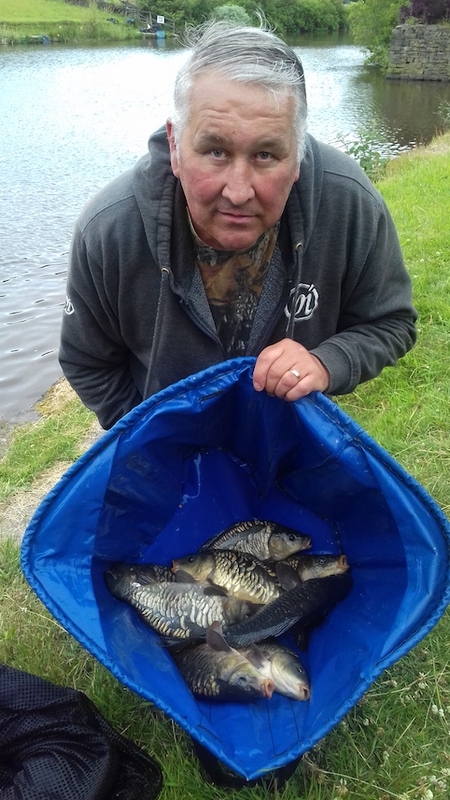 Simon Newsham lead Craig Gorton by a single point but Simon did not fish the last match so it was left to Craig to try and get 2 points or more to take the Championship, which he managed to do by 1oz from his dad, Mick. Click here for the full LEAGUE results. Well done to Craig! Our new Club Champion for 2018!!! The Chairmans cup was won by Nigel Ashworth. Simon Newsham heads the league on 26 points going into the last match of the season closely followed by Craig Gorton on 25 points. 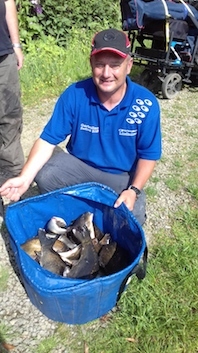 Simon wins the Rochdale Trophy Plate in peg 18. 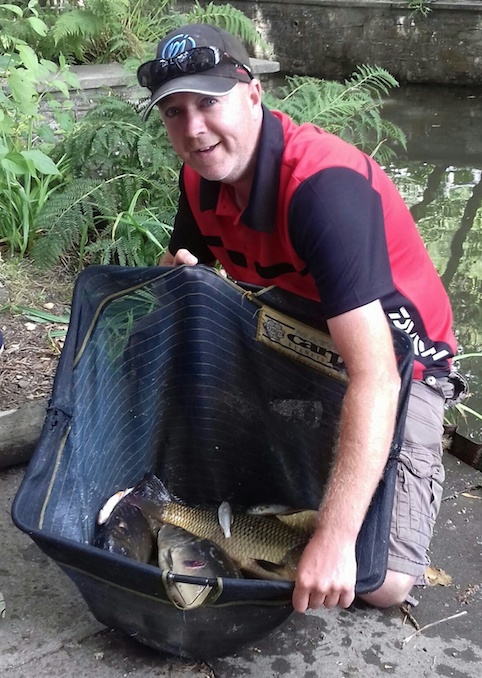 Danny Keenan wins the Arthur Cooper Memorial Shield in style at Partridge Lakes. A great win for Tim and Martin in the pairs match. 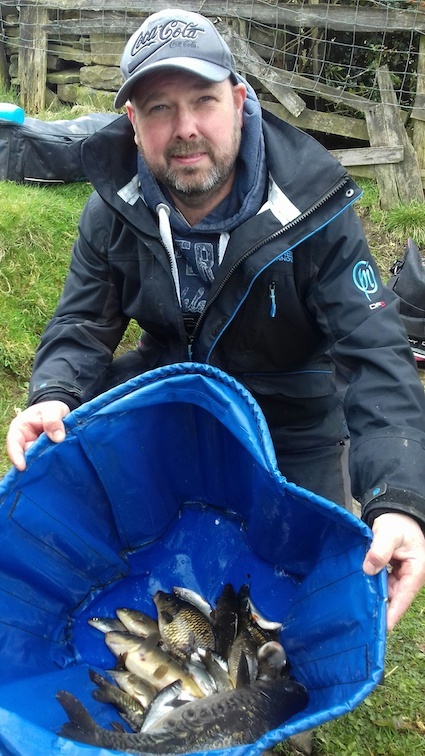 Also well done to Tim with a personal best on Lane Head of 23lb 8oz. Simon wins the Rudyard Cup at Moss Farm. 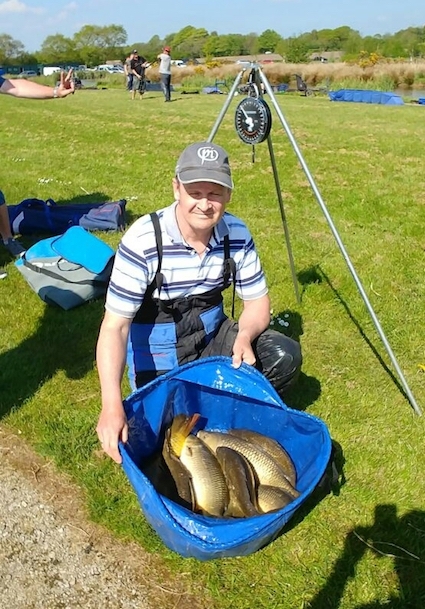 Also worth a mention was a personal best for Mark with 43lb 12oz. 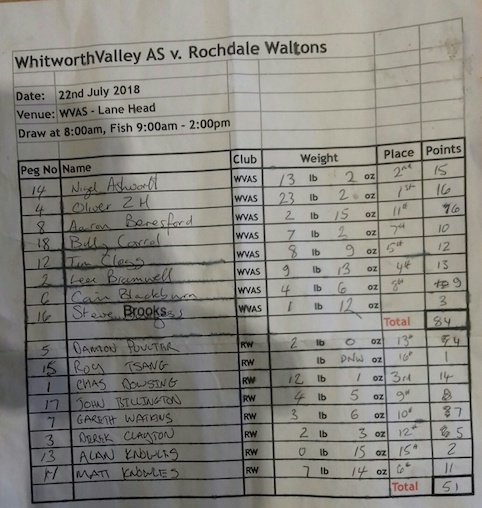 WVAS win the second leg of the challenge match against Rochdale Waltons. The total is incorrect on the sheet for Waltons and should read 52. The overall combined score for the 2 legs was WVAS 165 points and Waltons 107. 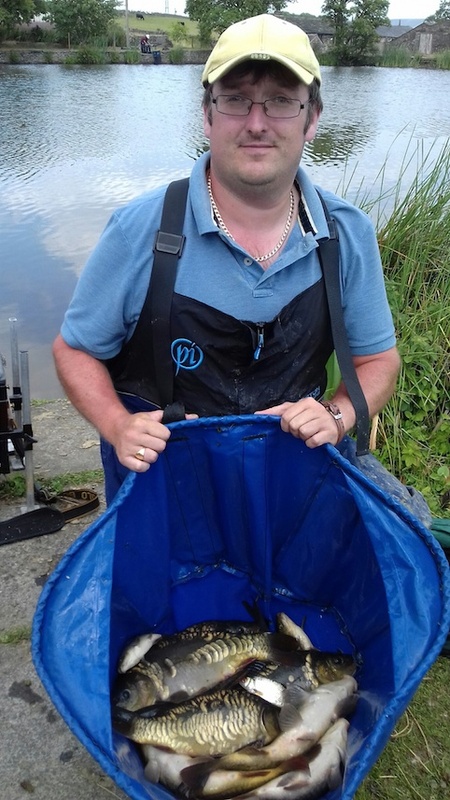 Well done to Olly winning the second leg with a fantastic weight of 23lb 2 oz. Jimmy Byrne wins the Homewaters Trophy in style by setting a new match record! 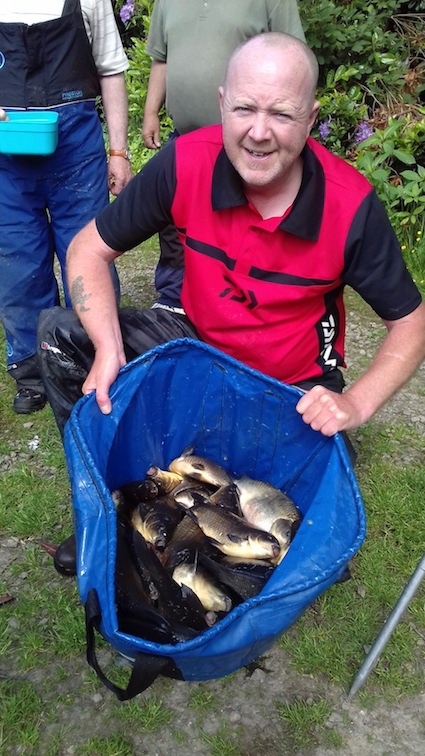 Also a mention for Lee with his personal best match weight at Lane Head. 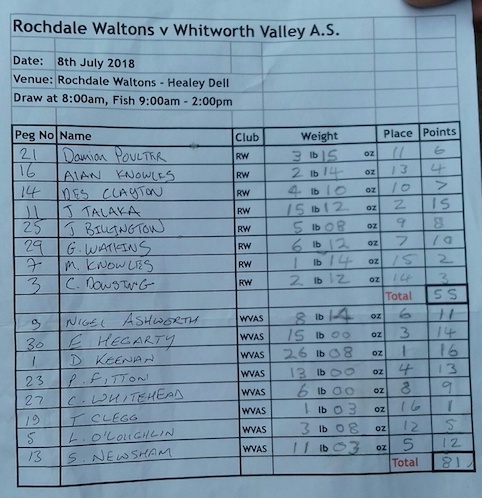 WVAS have a healthy 26 point lead after the first leg of the challenge matches against Rochdale Waltons. 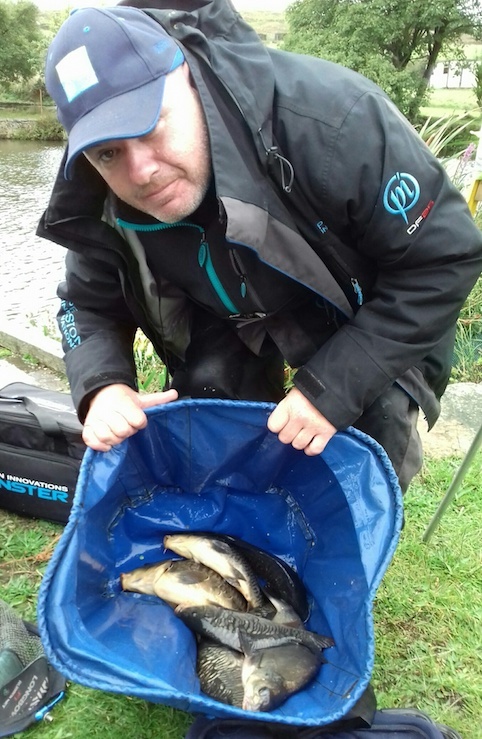 Well done to Danny, winning the match with 26lb 8oz out of peg 1. 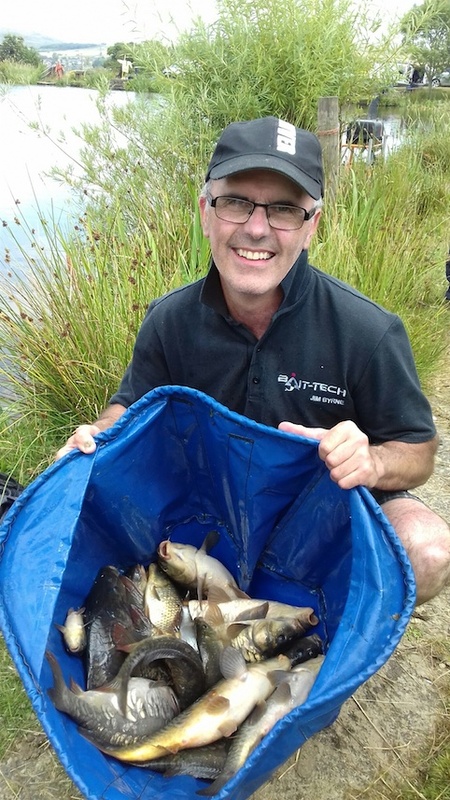 Craig Gorton wins the Calvin Clarkson Trophy on the 3rd of our away matches at Bradshaw Hall Fisheries on lake 3 (anyone got a spare bib!). This means that Craig now has a 4 point lead at the top of the league table. 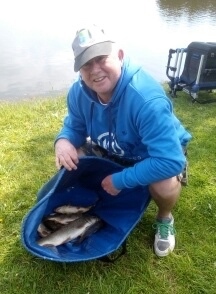 Colin Whitehead, using his secret ground bait additive, spawned off his mate Ian Heaps, wins the Stanley Pell cup. Eddy Hegarty gets second place to kick start his charge up the league table in an attempt to win the league three years on the bounce! 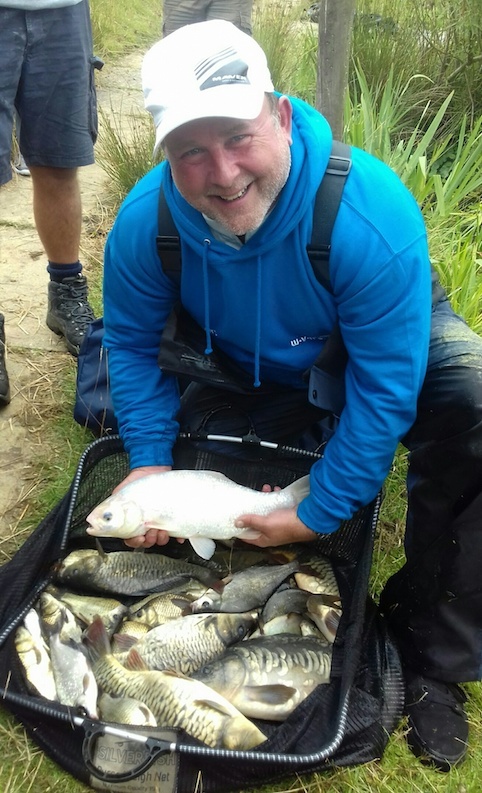 In one of the best starts to the new match season, Danny Keenan wins the Ronnie Bartrum Memorial Shield with a new club record weight of 181lb!! Unfortunately for Simon, his match record set a few weeks earlier didn't stand long. Some fantastic weights all round but also worth a mention are 3 new personal bests. Craig Gorton, Tim Clegg and Lee O'Loughlin (64lb). 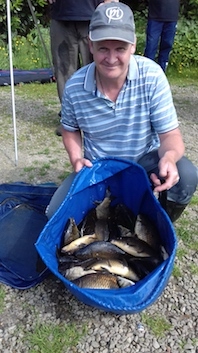 Over 1000lb of fish were caught by the 19 anglers who fished!! Well done to Andy Rowden for winning the G.A. Electrical Trophy at Lane Head. Craig Gorton heads up the League table after the first 3 matches with 8 points! 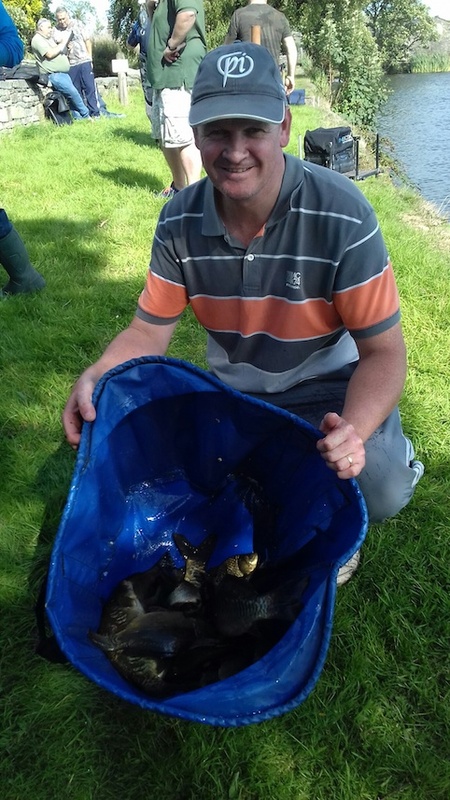 Congratulations go to Simon Newsham for winning the Canal Cup at Hall Lane Fishery. 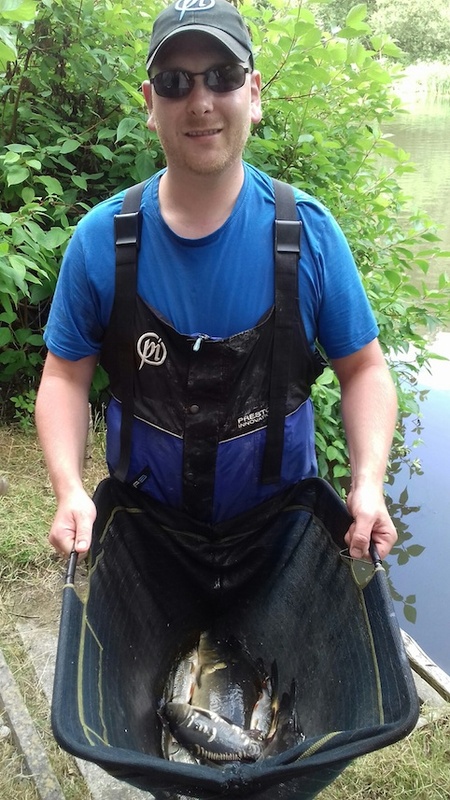 Simon's weight of 164lb is a new club match record!! Will anyone beat that weight this year for the Best weight Trophy? It's a tall order but still a possibility on some of the venues that are coming up. A few other photo's from the day - Jimmy Byrne, Lee O'Loughlin and Oliver Zebedee-Howard. Well done to Craig Gorton, winning the first match of the season which is the Work Party Trophy.